CTF ILLINOIS has three Advocacy Centers, located in Charleston, Champaign, and Frankfort, IL. Advocacy Centers offer individuals the ability to provide leadership, training, and advocacy for other individuals with intellectual and development disabilities while raising their voices as advocates in their communities, region and state. CTF ILLINOIS Advocacy Center (on right side of building in photo above), 701 6th St. Charleston, IL. Individuals are encouraged to participate in their own self-advocacy. 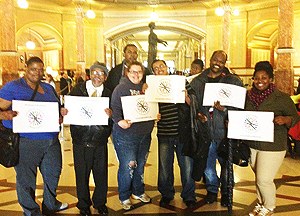 Individuals from CTF ILLINOIS are active members of The Illinois Self-Advocacy Alliance, Illinois Imagines, and SACIS. Individuals participate in Self Advocates Conferences, the Speak Up and Speak Out Summits, as well as various rallies throughout the State. Individuals further utilize their advocacy skills by holding monthly group meetings. These meetings focus on ways to develop and implement improved programs and activities for all individuals at CTF ILLINOIS. Individuals coordinate advocacy efforts through established partners while also creating and utilizing their own resources for research, information sharing, workshops, training and outreach. Individuals learn to use a variety of tools in their advocacy efforts such as social technology, newsletters, letter writing, videos, photos, radio and podcasts. The Advocacy Center is a place where individuals learn and use their voice to raise awareness on the issues of individuals with disabilities.